If you are considering hair extensions but you’re not quite sure you are ready to take the plunge, there are some hair extensions benefits to know about to help you make your decision. Although hair extensions may not be for everyone, there definitely are advantages of getting hair extensions. Most people simply assume that extensions are only for adding length and volume to your hair, and although those are great benefits, they are not the only ones. 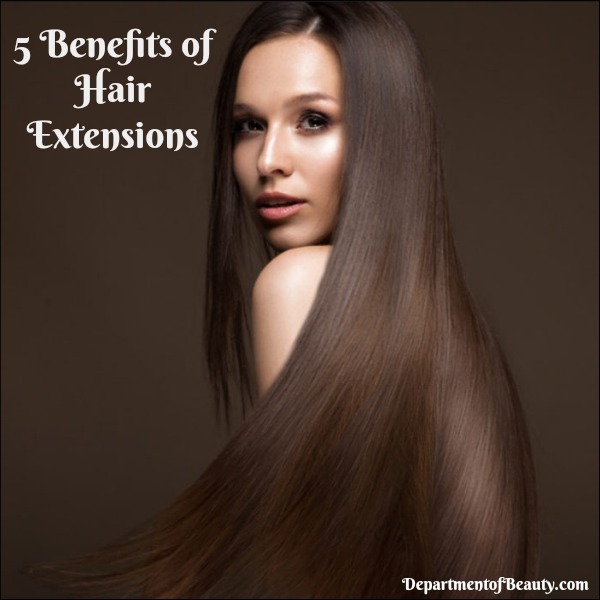 I’ve come up with 5 benefits of hair extensions that may help you sway your decision making. Even though I stated that adding length wasn’t the only benefit of hair extensions it probably is the most popular one. Adding instant length to your hair is the number one reason why women consider getting hair extensions. Maybe you have the type of hair that simply won’t grow past a certain length no matter what you do. Or you have dyed your hair so much that the ends simply just are completely fried. Whatever the reason you want to add length to your hair, extensions can do that instantly. You don’t have to wait months or even years to get your hair down to your middle of your back. You don’t have to sit around and hope that your hair decides to start growing again. With hair extensions you can have whatever length hair you want right then and there. If you want to change up the color of your hair but you’re not sure you want to take the risk of actually permanently dyeing your hair, you can add in some different color hair extensions and get the same look. You can go with an ombre or balayage style with having a different color towards the middle and ends of your strands or you can go with some highlights and add in the color all throughout your hair. You’ll find that you can find just about any color of hair extensions from purple extensions to all different shades of blonde and brunette. Along with adding color and length to your hair, extensions can also add volume. If you suffer from thinning hair, extensions can be a great way to add in that volume so you get the hairstyle you desire and you have more self-confidence. Even if you have had thin hair all your life you can still use hair extensions to add the volume you may have always wanted. There are even some brands that are made specifically for adding volume and have a heavier, but still natural weight to them. Did you recently cut your hair and now you are regretting it? Or maybe your stylist didn’t really get the style right on your haircut. It could be that you used to have short hair and now you are going through that awkward growing out phase. You can get extensions put in and help you get through these times without having to simply just suffer with the hair you have. Those few months you have the extensions in your hair can make a difference in what your natural hair looks like. It could mean no weird growing out phase or it could mean that people don’t have to know you got a horrible cut. Just be sure that you choose extensions that won’t hinder the growth of your hair such as clip-in extensions. Are you the type of person that has had the same hairstyle for the past 10 years? Do you want to change things up but you don’t it to necessarily be a permanent change? If this sounds like you then hair extensions may be the best option for you. Although the cost of hair extensions can run high if you get the natural hair professionally done, there are other options such as inexpensive clip ins that you can use as well. With the additional length and volume you can most likely pull off a lot more styles than you could with your natural hair. For example you could try all different types of fancy braids or buns. You can add more interest and style to a traditional straight hair cut without having to take the plunge of it being permanent. Of course for some people there will be some drawbacks to having hair extensions, but with all the great benefits you’ll find that hair extensions may be a great option for you. And remember, the best thing about hair extensions, especially the easier to remove ones, is that you they are only temporary and you can go back to your normal hair at any time.